Vice-president of the Chamber of Deputies, Mr. Florin Iordache, delivered a speech at the official opening ceremony of the Romanian Presidency of the Council of the European Union. I have the honor to address to you on behalf of the Chamber of Deputies the Romanian Parliament and I would like to begin by assuring you that the parliamentary majority will support the Government in all its actions to fulfill with honesty and dignity the its mandate for the following six months to the Presidency of the Council of The European Union. At the same time, despite all the political comments that have to be seen in the light of the electoral year we are in, I want to assure you of the total pro-European openness and our sincere desire of Romania to consolidate its status as a member state with equal rights within this large family called the European Union. Our decision, the decision of Romania to join the European Union was a sovereign decision, expressed to the highest degree, when the Romanian people adopted by referendum the new Constitution of Romania that actually opened our European path. It was the sovereign decision of the Romanian people to take the European path and to get here today in the most honorable position to lead the Council of the European Union. We want to be Europeans and we also want to be fully treated as European citizens. Romanians continue today to have the highest trust in the European institutions. Personally I am convinced that my fellow citizens also think that they cannot imagine Romania outside the Union. We feel that we are part of this European family and we want to work together for the good and the progress of the Union. Romania is a country you can rely on for the European construction and that is why I think my country deserves to be respected as a reliable partner in the realization of this ambitious project called the European Union. Today, more than a decade since our country’s accession to the EU, it is for the first time when Romania takes over the rotating presidency of the Council of the European Union. And even if my country’s role in this hypostasis is to give priority to the European agenda over the national agenda and I am telling you with all my conviction that we assume this role in a sovereign way, being aware that in this role Romania has a duty to be a wise mediator, meant to urge a consensus freely agreed by the Member States of the European Union. We will fulfill our mission with dignity and I guarantee you that in Bucharest there is a strong political will that Romania successfully accomplishes its mandate at the leadership of the Council of the Union. I assure you, Mr. President Jean Claude Juncker, that the decision-makers of the majority political party in Bucharest understood very well what it is Romania’s role in this position. I have treated with all seriousness the recommendations for ensuring the political consensus during the Presidency. 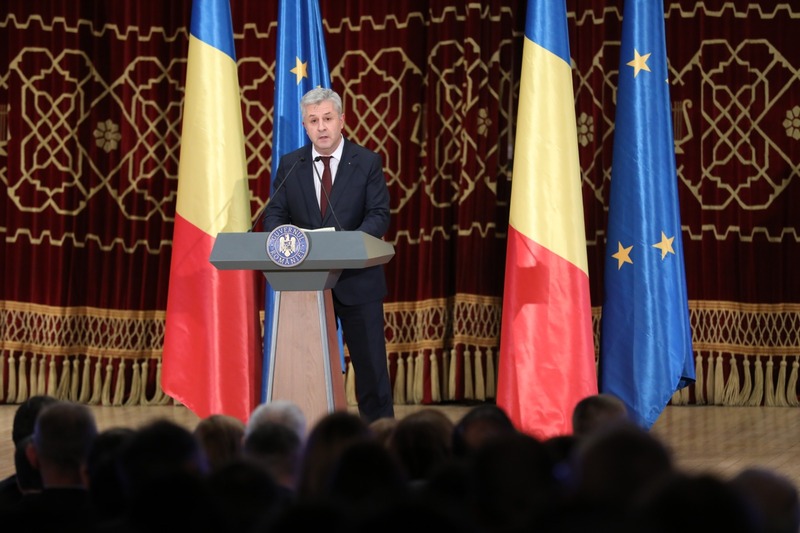 The Prime Minister expressed a similar appeal to the Romanian Parliament, which was addressed to all political parties. And personally, as a representative of the Chamber of Deputies, I reiterate this call for consensus to all parliamentary groups. Of course, we need to understand the electoral context we are in. I am not only referring to the spring European elections that will lead to elections in all Member States. Romania will also have presidential elections in winter, and next year we will organize legislative elections. Therefore, electoral manifestations that sometimes have a more blunt expression are felt and likely to be felt in the next 6 months. I assure you, however, Mr. President Juncker and I assure all our European partners that the parliamentary majority in Bucharest has the necessary wisdom and political maturity to assist the Government in fulfilling its honorable mission to the presidency of the Union. I hope that the same approach will be adopted by the other political forces. But at least as far as this political majority in the name of which I can address to you, I can assure you that it will show balance, wisdom, responsibility, so that the natural political disputes in an electoral year will not affect the mandate of the Romanian Presidency at the Council of the European Union. Romania will demonstrate that it is a trust-worthy country that can accomplish its mission with honor. You can count on a good Romanian Presidency of the Council of the European Union!